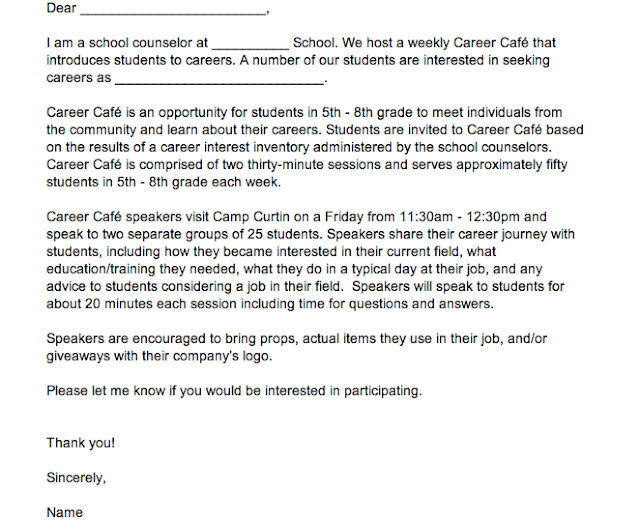 One the most frequently asked questions I receive about Career Café is "how do you decide which students you invite?" 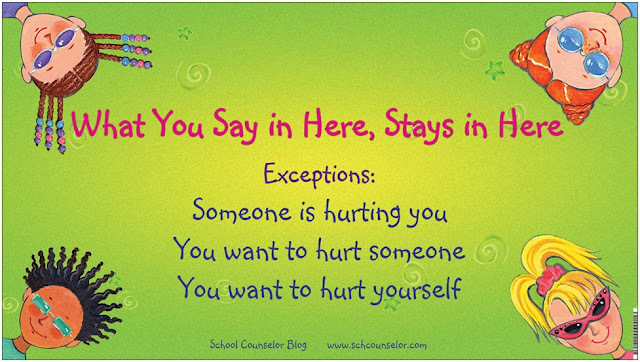 This answer may be different for everyone who is reading this post! We all work in different size schools with different grades and different populations of students. We may serve elementary students, middle school students, high school students or even college students! We may have 300 students on our caseload or 3,000! I must reiterate the best part about Career Café is that you can make it fit YOUR needs and YOUR population! If you are planning to start Career Café for the first time ever I would recommend targeting a specific population or group at your school. 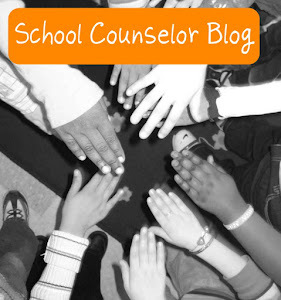 Starting out with one grade level or group will be much more manageable. If I had to do it all over again I would have made Career Café for specific grade levels instead of trying to do it for every grade I served. My original goal was to serve as many students as I could. More is not always better. When you are trying to create a program from the ground up you want to be purposeful about what group you want to serve. Once you decide which group you will be pulling students from, you can use career interest inventories to determine which students to invite to specific sessions. 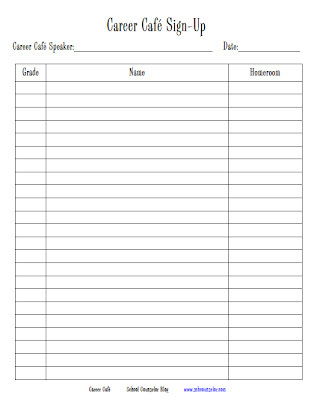 You could also use a Career Café sign up sheet for extra spots or for students or for other students who express an interest in a specific Career Café. 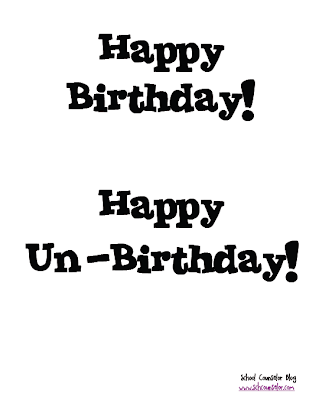 Click on the image below for a PDF version. *If you want some specific advice of which students to select, catered to your school and needs, leave a comment below or contact me! Now for the fun part! Inviting students! Students absolutely love to be invited to Career Café! To manage this, I make sure to give invited students passes. There are a few different ways you can create passes for Career Café. 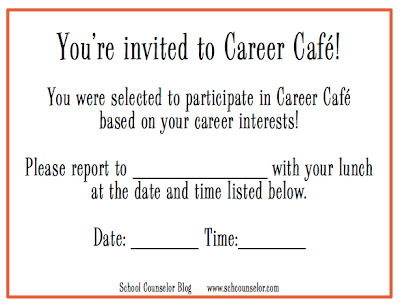 I used a Microsoft Word postcard template to make the Career Café pass below. 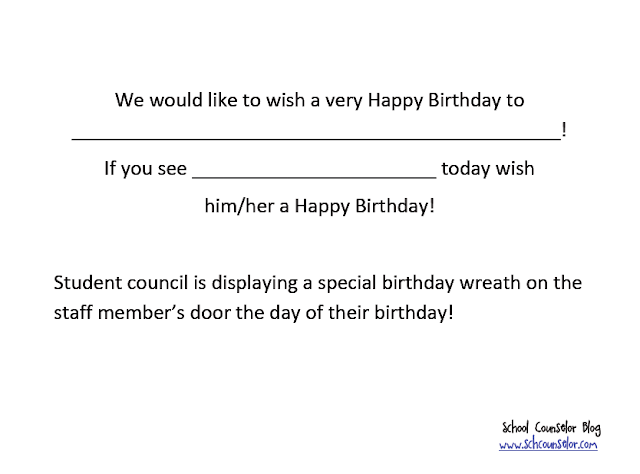 You can download a printable PDF version of this pass and use it at your school! You could also make a generic pass without a specific date and time and laminate it so you could re-use it for each session. 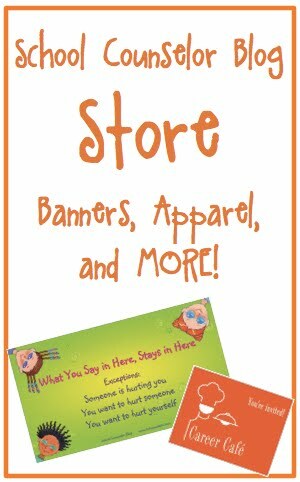 I love using VistaPrint to create items for school! I created postcard size passes and business card size passes for my Career Café. The VistaPrint Career Café passes I created look professional and give the feel of a cohesive theme. 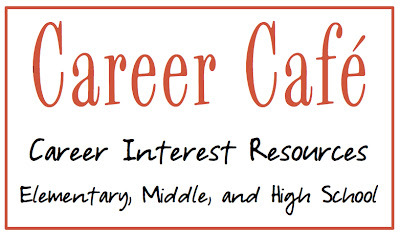 You can create your own Career Café passes on VistaPrint or order them from the School Counselor Blog store. 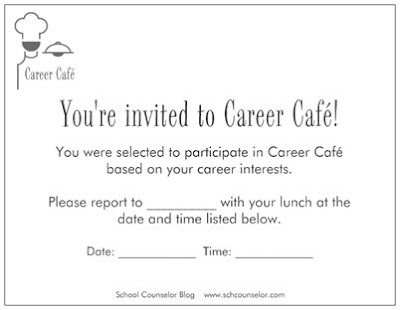 How do you determine which students to invite to Career Café? 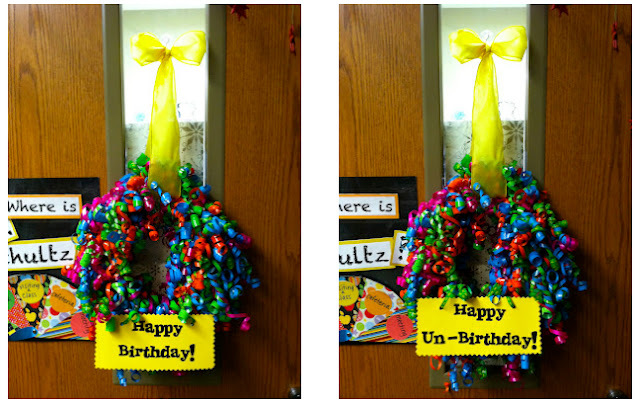 How do you create passes or invite students? This post is the fifth post in a series of how to host a Career Café at your school. Since starting Career Café I have hosted 13 speakers (8 the first year and 7 the second year). I was worried at first that I would not be able to find speakers, but in the words of Kevin Costner from Field of Dreams, "If you build it, they will come!" 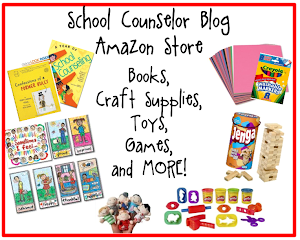 and don't forget School Counselor! Once I get an idea of who I want to invite I call or send an email. Below is an example of how I typically explain Career Café to prospective speakers over the phone or through email. I also usually give them the dates we have open so it makes it easy for them to just pick a date. Feel free to make a copy of this document and edit it to meet your needs! What education/training did you need for your current position? Describe a typical day at your job? What advice do you have for students considering a job in your field? I explain that they have about 15-20 minutes to speak to students including time for questions. Speakers are encouraged to bring props, actual items they use in their job, and/or giveaways with their companies logo. The last 5 minutes I reserve for student questions. I ask students if they have any questions related to the individual's career journey or education. 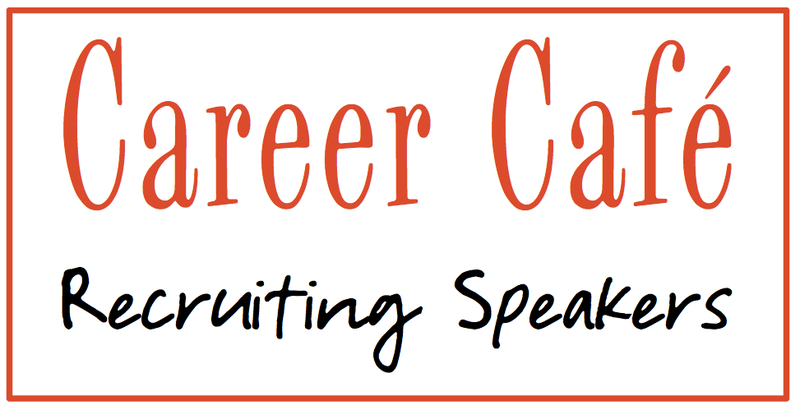 How do you recruit Career Café Speakers at your school? 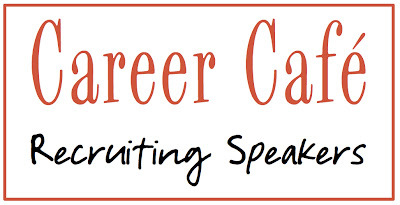 What questions do you ask Career Café speakers? How do you prepare them? 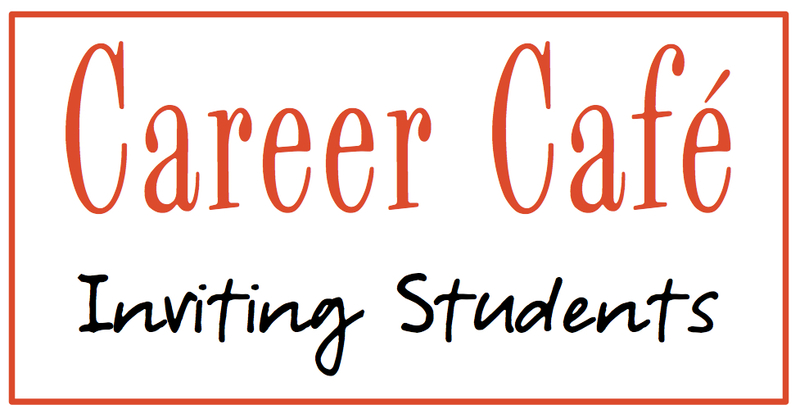 This post is the fourth post in a series of how to host a Career Café at your school. 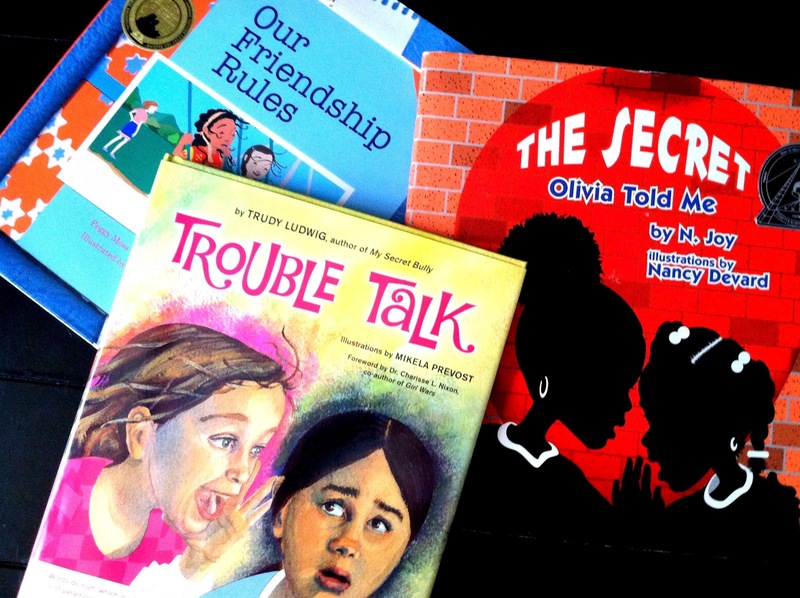 During the last week of school I was trying to come up with a way to catalog all of my school counseling books. I have TONS of school counseling books! I wanted to find an easy way to look up what books I have. I also wanted a way to provide others with a list if they wanted to see what books I have. I was thinking of creating a spreadsheet when I decided to see if there were any iPhone apps that would do it for me. I was looking for something that would allow me to scan the bar code of the books and put them into a database. Below is a screen shot of the opening page of the Book Crawler App on my iPhone. To enter a book, click on Books. Next you click the New button in the upper right corner of the app. You are given the options to enter the book manually, use Google Books, or use the ISBN Scanner. 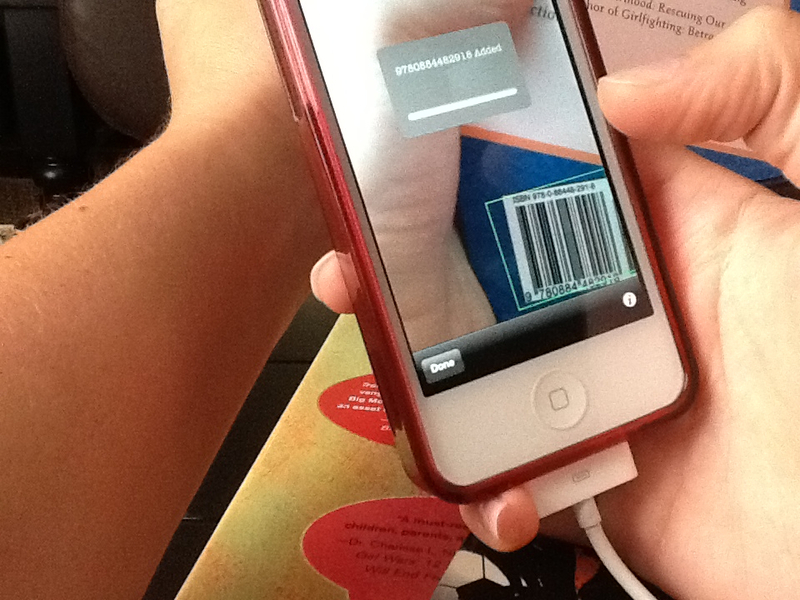 To scan your books in, click on ISBN Scanner and let the scanning begin! 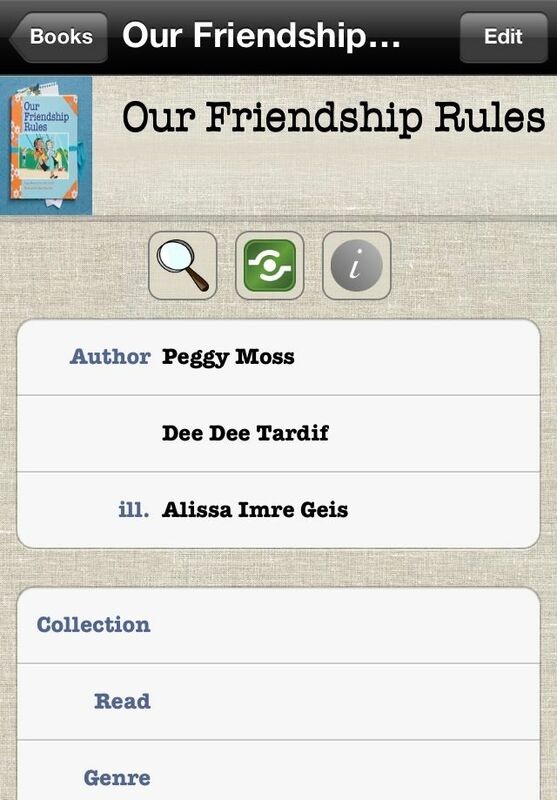 Scanning Our Friendship Rules using the Book Crawler App. So cool how the little scanner comes up and scans your UPC! 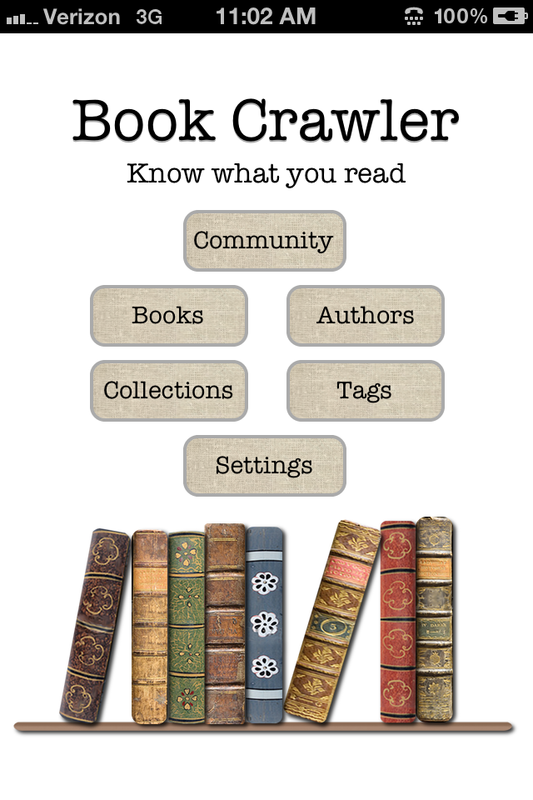 The Book Crawler App uses information from the Google Books database to find information about the book including the title, picture, the author and illustrator. Once you have scanned your books into the Book Crawler App, you can categorize your books, loan them, export the database to an excel file, and more. 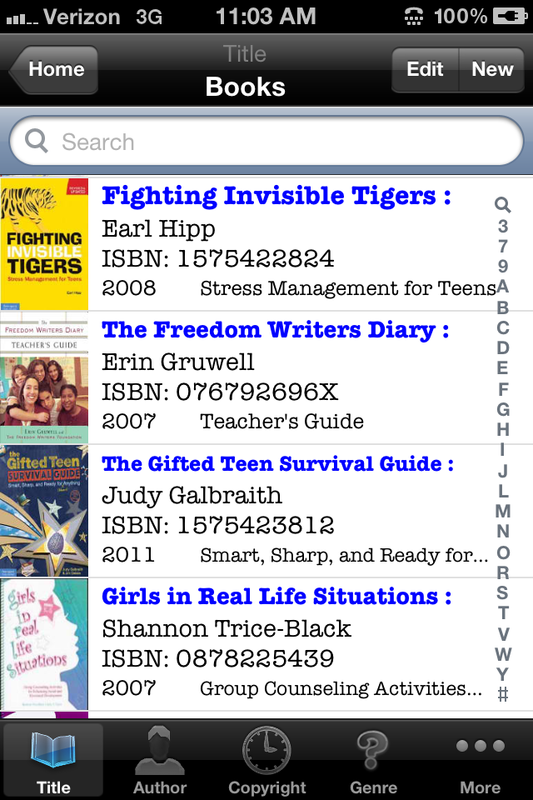 Screen shot of my books in the Book Crawler App. 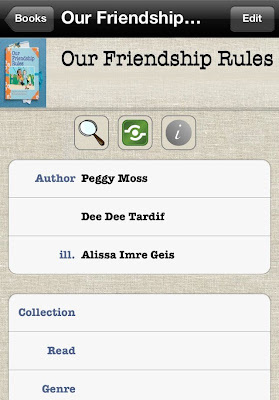 You can scroll through the list of books alphabetically by title, by author, by category, genre, and more. 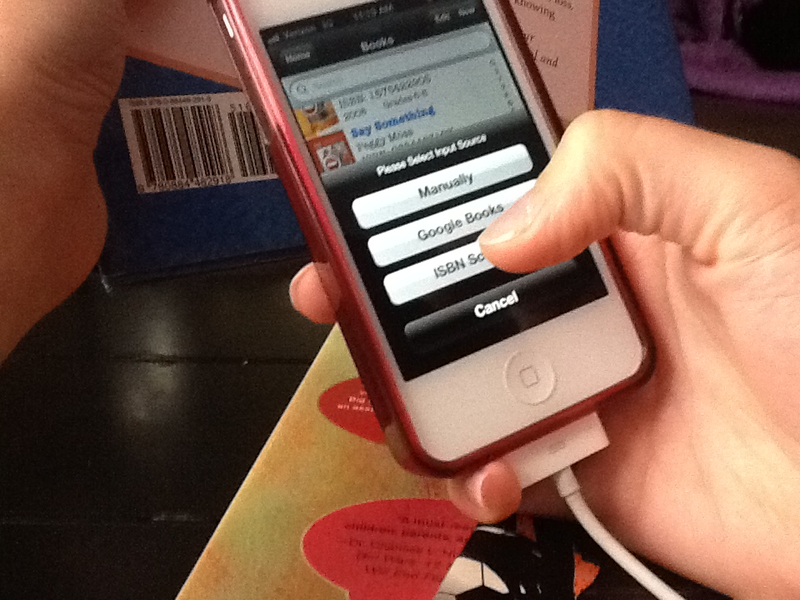 You can also turn your phone sideways and flip through the books with your finger! 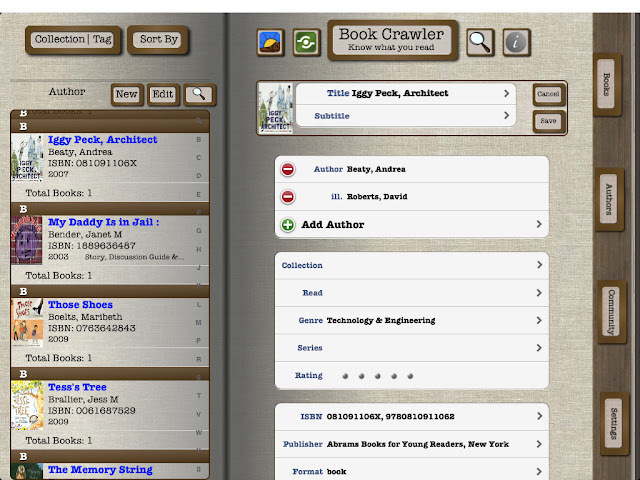 If the book does not come up in the data base, the Book Crawler App allows you to take a photo and upload it using manual entry. This book, Rhinos & Raspberries, was a free book previously available from Teaching Tolerance. 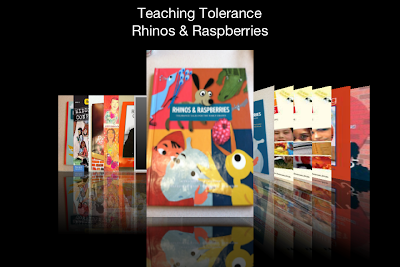 Rhinos & Raspberries was not in the database, but I was able to manually enter the information and provide my own photo. 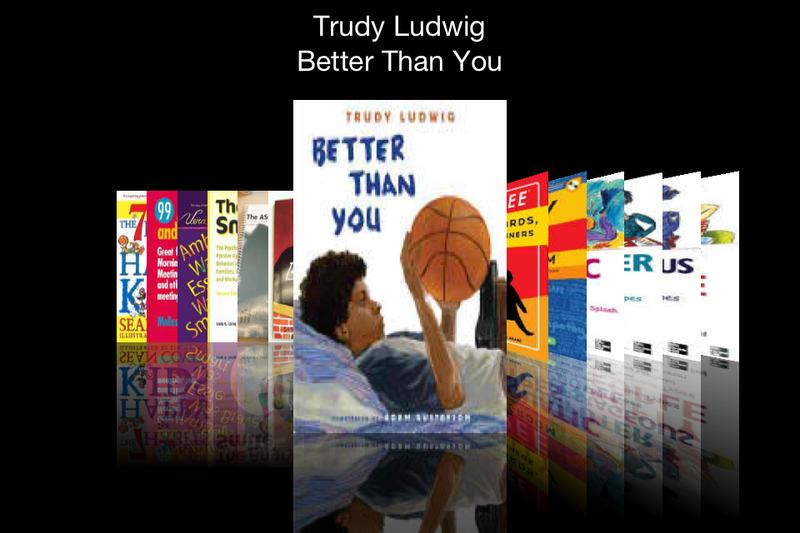 The Book Crawler App also works with the iPad. Screen shot of my books in the Book Crawler App on the iPad. My only complaint about the Book Crawler App is that the iPhone app and the iPad app do not sync automatically. It can be a little tricky to upload your Book Crawler App database to the iPad. Even after you do this you will have to continue to update one of the devices. There are instructions to transfer data to another device. I recommend using the DropBox method. My pictures did not show up automatically and I had to go back through and click on the information button to have the pictures to appear... which was quite a task for 135 books. My tech savvy school counselor friend, Andrea Buston of JYJoyner Counselor, just did a review of the Book Crawler App for the iPad. 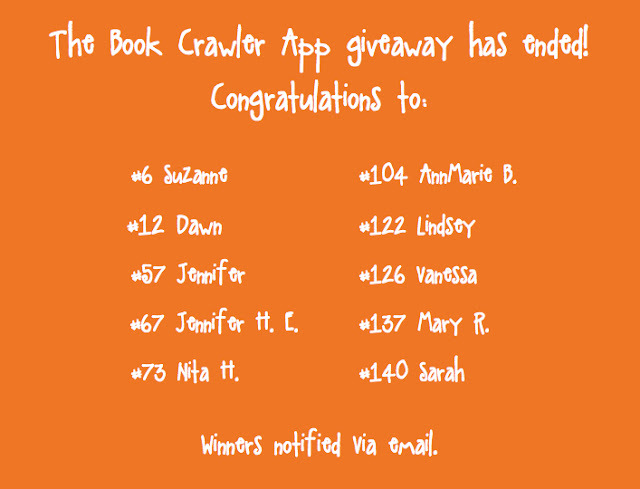 (If you purchase the Book Crawler App it works on the iPhone, iPod Touch, and iPad). I recommended the Book Crawler App her at the ASCA Conference after seeing her post about her book inventory process in which she created a Google Form to enter her books. Because I loved the Book Crawler App so much I reached out to the creator Jamie Stokes, Lead Developer and CEO, Chiisai App Solutions to see if she would be willing to give me a download code of the Book Crawler App as a giveaway. She far exceeded my expectations and gave me 10 download codes to giveaway! So, I invite you to enter the giveaway below! 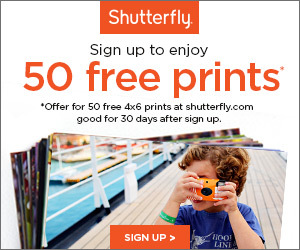 For this giveaway I am using Rafflecopter. The giveaway will open on July 4, 2012 at 12:01am EST and close on July 8, 2012 at 12:01am EST. See below to enter! There are a number of ways that you can determine how students are selected to participate in Career Café. Students can be chosen based on results of career interest inventories, select which Career Cafés they would like to attend, or entire classrooms or grade levels can be invited to participate. The size of your Career Café location dictates the number of students you are able to select to participate in a Career Café session. 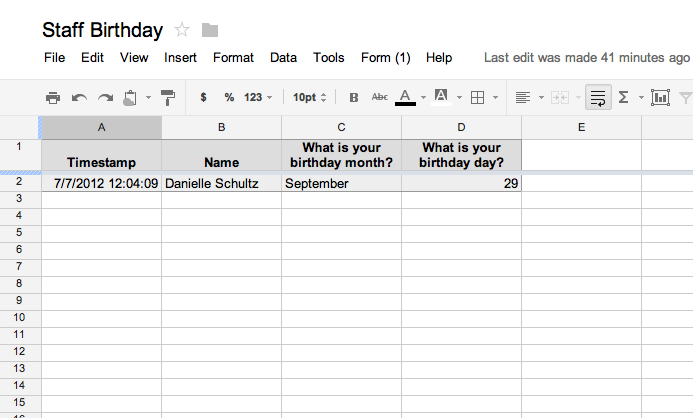 I recommend creating a list of students who you plan to invite so you can determine if their are enough participants or too many. At my school I hosted Career Café for grades 5-8. Last year, for grades 5 and 6 I used the Holland Code Career Party and had students sign-up for Career Cafés that related to their interests. Below I have provided links to various FREE career interest inventories and games. Most of these resources require computer access. I have also provided a list of books you could utilize in classroom lessons and activities with students in conjunction with Career Café. I keep emphasizing this, but you can really make Career Café your own. If you are at a smaller school, it may be possible for you to invite a whole grade level or whole classrooms to Career Café sessions. 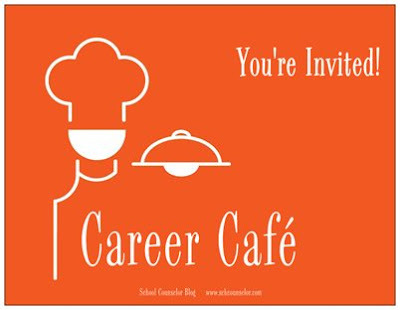 You may decide you only want to host Career Café for a certain grade level. There are many different ways you host Career Café and choose which students to invite. Do you host a Career Café at your school? 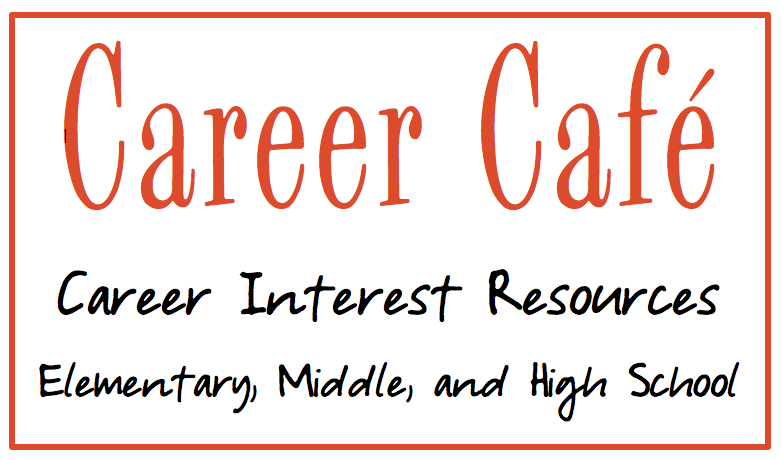 What career interest inventories and resources do you use? 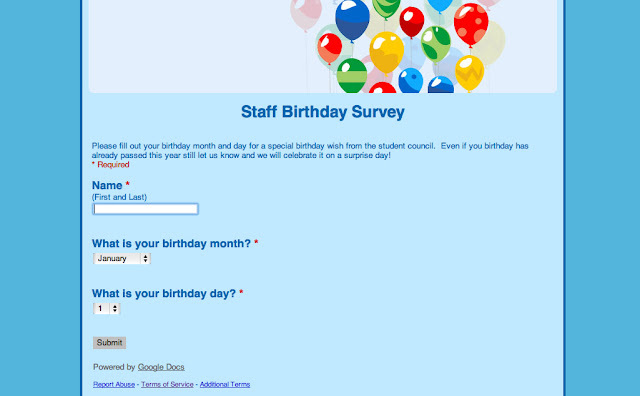 How do you select students to participate? This post is the third post in a series of how to host a Career Café at your school.